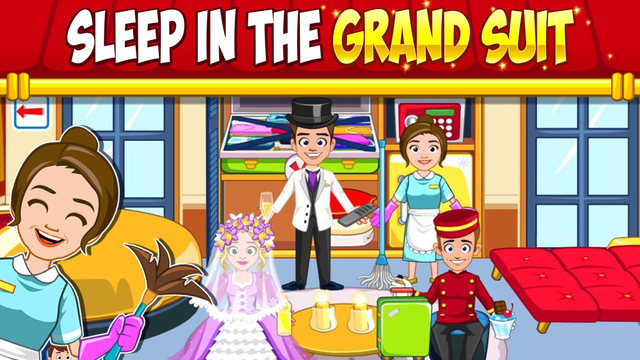 My Towns new grand Hotel has fun and adventure in EVERY room! Let the bellboy carry the suitcase for the honeymoon couple, make sure the kids are playing nicely at the pool and at the hotels playroom! With the tastiest fruit cocktails, huge pirate ship and our NEW EMOTION FEATURE; The My-Towns new hotel is finally open ! My Town games are all about experiencing, imagining and having pure playtime fun. Our digital dollhouse games allow millions of kids to have a new adventure everyday! Our games promote imagination and stress free fun for kids when playing alone or with a parent. 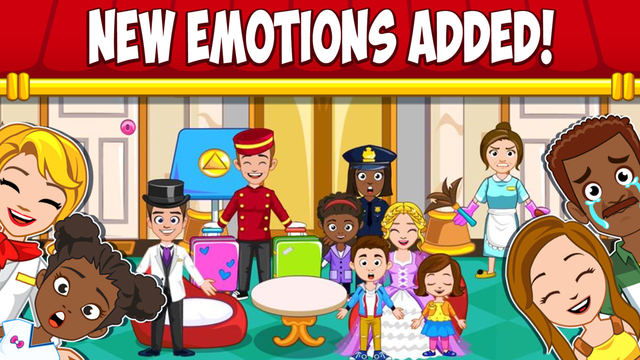 You can now Change your characters expression and make them lough, there are 6 expressions to choose from for your character: Happy, Sad, Laughing, crying, relaxed and even a surprised face. To select an expression simply double tap your character. or make a long press on him. Your new hotel has lots of adventures and fun in every room. Sleep at the grand suit after some fun at the pool with the kids or dress up for your evening dinner at the hotels restaurant. With lots of costumes such as bride and groom, pirates and sailors and the abitly to imagine and set your characters expression the possibilities are endless ! – Its not fun if you cant lough, you can select you character's expression by simply double tapping him or long press on him.- Sleep and party in the grand suit, honey moon at the love suit or relax at the green nature room. – Your luggage has all your clothing and costumes, place the luggage in the clothing cupboard as you enter your room to select clothing. – a Cleaning lady that does not like spiders, clean all the spider webs forming around the hotel to keep the place clean and tidy. – Check out the sofa that turns in to a double bed at the red grand suit room. – New characters added and you loved ones are also here! Kids 3-13 : The young ones play with parents while the older ones play alone.Full parental control : Safe to play even when you are not aroundNo Ads or In App Purchases.New locations means new interests and a lifetime game play of over 1 year!